Craftster is my absolute favourite crafty haunt, and when the Apocalyptic Fashion Swap Round 2 popped up, I couldn't help myself, I HAD to sign up! I love possible-future movies and books, and though these are mostly sci-fi, they still lend themselves to the aesthetic. In this post, I'd like to talk about some of my favourite films and novels in the genre. Please note, zombies don't exist in my reality. Two of my all-time favourite post-apocalypse movies just so happen to both star (and be directed/produced by) Kevin Costner. The Postman is another movie I hadn't seen since childhood, and re-watched about 2 years ago now. Then I found out it was based on a book, and yes, the book is better. It just so happens I liked David Brin's work BEFORE I knew that he wrote this particular novel. I'd read his first 3 Uplift novels as a teen, and they're AWESOME. Waterworld, which I didn't know was the biggest waste of money in all of Hollywood history until around last Christmas, was one of the few movies my brother and I could agree on to watch! It was just such a sweeping epic to our little minds! For a really unique spin on how humanity can survive a global nuclear war that pretty much destroys the planet, read Octavia E. Butler's Xenogenesis trilogy. 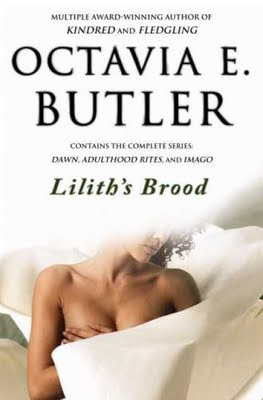 It was re-published in 2000 as Lilith's Brood, a far inferior title, in my opinion. I got my copy at a yard sale, where it was boxed with an assortment of sci-fi and thriller novels. When I saw the title on the spine, I grabbed that sucker like my life depended on it! 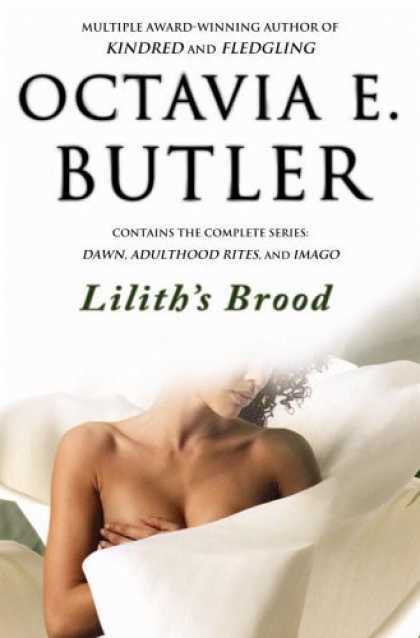 Lilith's Brood would likely not even garner my notice (please compare the crappiness of the re-print's cover). The short of it is that various military powers went at it with ICBMs, killing pretty much everyone in populated areas, irradiating most of the world's biosphere, and generally f*cking the whole damn planet. It just so happens the Oankali were hanging out, monitoring Earth to see if it was worthwhile to offer a gene trade to our fledgling species. They were so upset to see that our self-annihilation was not agreed upon by the whole of Earth's population that they did something unprecedented: they rescued us. And I know if I don't put Mad Max on here as a source of inspiration, I may be subject to catcalls and booing :P What I like about the apocalyptic aspect of the movie is that the downfall of humanity has no clear cause that's fleshed out. From vague references and the general feel of the movie, we can assume that a global war has caused the dissolution of civilization as we now know it, leaving people to live in a quasi-communist/quasi-feudal society. Communist because small groups of people have turned insular, pooling resources to survive, and feudal because they fall prey to roving bands of marauders who demand "tribute" from the communities that fall within their "territory." If you've seen the movie, then you know what happens when they don't get what they want. In all of these dystopic films, do you notice the bad guys tend to have the cooler wardrobes??? Next post: apocalyptic fashion in exquisite detail!